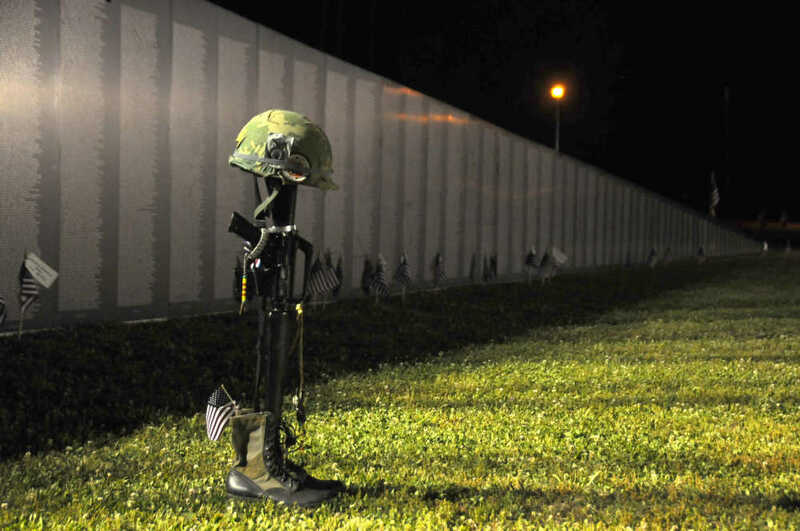 Photo courtesy www.BootheelPhoto.com In the darkness, a loan M-16 stands mute tribute in front of "The Wall" in New Madrid last week. The traveling Vietnam Veterans Memorial wall is scheduled to be in Dexter's East City Park by the Park and Recreation gym from August 6 through 10 and is normally open 24 hours each day. For more on "The Wall," see "A Different Drummer" below. Those of you who know me know that I am rarely speechless, yet words didn't come as I traced my fingers lightly over the inscription. I'd barely known him, although I had gone to school, and been friends, with his youngest sister. She and I never talked about him. He had probably gone into the army as a draftee, as so many like him did in those days. He probably had a sense of national pride and excitement as he left home...mixed with fear. When he went to Vietnam he was a little older than my youngest son is now. Thinking that gives me the merest hint of the fear and sorrow his parents must have felt when he left...and it breaks my heart to think what they felt when they were told he had been killed. I still remember, as a grade schooler, being told that he was killed just a day short of rotating back to "the world". The entry I read on the computer at the wall that night said he died of multiple fragmentation wounds and that he was a sergeant, the same rank I was when I got out of the Marine Corps. He was Army. It was dark, 11:50 p.m. by my watch, as I stood before the wall. I'd told my editor that I thought night photos would be dramatic. And they were. The M-16 stuck into the ground by its bayonet with the wall fading into the distance. The M-16 that represented those thousands upon thousands that were stuck into the ground with the deceased soldier's helmet on top, in homage to the lost brother, son, father, husband. Most were killed in their prime. 39,996 names on the wall were people 22 years old and younger -- still kids, but driven into adulthood by the horrors they saw and by those they were part of. There are 58,267 names on the wall, names of men and women who were killed or who went missing in the Vietnam "conflict". Most veterans feel that "conflict" is too warm and fuzzy a name to represent something so horrible. A friend of mine who lost an eye in 'Nam and was soon to lose the other one, told me, "they can call it a conflict, but it sure felt like war to me." He left more than an eye in Viet Nam; he left too many friends who were his brothers, and every trace of innocence he ever had. He told me once that those who died over there were the lucky ones. He may be right. I might argue that most who came back died over there, at least a little bit. I could also say that many loved ones who never went to 'Nam died over there, at least a little bit. If you missed this traveling replica of the Vietnam Veterans Memorial wall during its time in New Madrid, you can see it when it is at Dexter's East City Park by the Park and Recreation gym. It is scheduled to be there August 6 through 10 and is normally open 24 hours each day. And if you go, do so with a sense of respect and reverence. There are a lot of names on the wall of those who are loved and missed by all the soldiers, sailors, airmen, and Marines who are visiting. I may go back to see it, but I'll probably go late at night. That's when some of the photography can be dramatic...but that's not the real reason. I've seen some really good photos taken at the wall in the daylight. I'll go at night because it's darker. If you don't understand, you really need to go to the wall...and be quiet...and think.